Gene Weingarten wrote a very funny satirical article in The Washington Post today about the Chevrolet Volt. That’s the “volt” referred to in the title; Weingarten is the “dolt,” by his own admission. Like most people, I suppose, I didn’t know much about the Volt before I read Weingarten’s article. From what little I knew, it seemed like just another green-inspired scam. So few people seem to want it that the government has tried to fake demand, bribing consumers with a $7,500 tax rebate just to buy it or a similar car. I’m always suspicious when the government tries to force products like that on us — e.g., that overpriced curlicue light bulb we all have to buy someday soon. In the case of electric cars, the demand isn’t being created by legislative fiat but by giving my tax money to other people so they’ll buy the damn thing. I may not be an economist, but I know that kind of demand creation is bogus and likely to fail, at great cost to us taxpayers. Here’s what I got from Weingarten’s highly chucklable piece on the Volt: Sounds like a pretty neat car! He had one for a day to test (hard to get that, as he explains), and he interviewed people who drive them. Learning something about how the car works corrected many of my earlier impressions. I heard some forgotten talking head the other day say that anyone driving an electric car and stuck in traffic for nine or ten hours in Washington’s recent snowstorm would be in serious trouble. The battery would run down, the car couldn’t move, there would be no heat in the car, etc. Sounded pretty gloomy, until I learned enough to know that this particular talking head (like most of the others) didn’t have any idea what he was talking about. The Chevy Volt runs on a large battery, true. It’s good for 30 or 40 miles, depending on a number of variables. But when the battery runs down, a 1.4 liter, four-cylinder engine with a 9.3 gallon fuel tank automatically starts. The engine doesn’t drive the car at all; it charges the battery, operating at a constant RPM, and the battery continues operating the car. 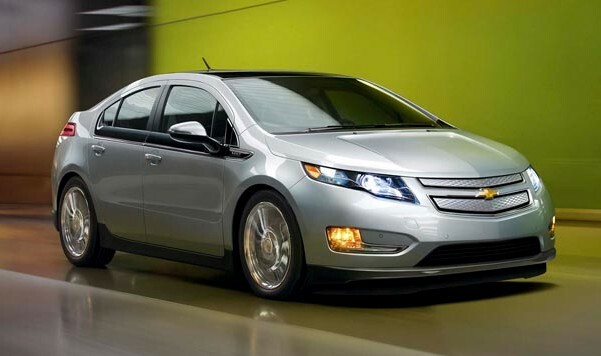 The Volt is comfortable, luxurious inside, and extremely quiet. When the battery runs down and the gasoline engine comes on, the driver doesn’t hear anything or feel anything. No jolts, power surges, nothing at all. After the engine is running, a very quiet hum is the only sound that can be heard. Performance is also surprising. Rapid, full-power acceleration from the beginning because of instantly ready battery power, zero-to-60 in 8.8 seconds, all that other yada-yada technical stuff. One reason I always thought of the Volt as something of a scam is because of the simple fact that energy has to come from somewhere, and it’s never free. Since about two-thirds of America’s electricity comes from burning coal and natural gas, there’s a pollution cost when the car’s plugged in to recharge the batteries. Beyond that, the proud Volt owner has to pay for the electricity his car is sucking up in the garage at night. However, as Weingarten explains, burning coal and natural gas to produce electricity is, on balance, less polluting than burning large amounts of gasoline in cars, as we do now. It also matters where you’re driving your Volt — in California, a lot of electricity comes from nuclear power and the pollution cost is very low; in Pennsylvania, most electricity comes from coal-burning power plants and the pollution cost is much higher. In addition, the consumer’s dollar cost for the electricity required to recharge the car is actually very low, regardless of the pollution cost. There are other electric cars coming on the market, in addition to successful hybrids like the Toyota Prius. But, from what Weingarten reports, the Volt is superior to competitors like the Nissan Leaf and a Tesla Motors (whatever that is) version. Ford is also supposedly producing an electric version of the Focus. Looks to me like they’re going to have trouble besting the Volt. But, as they say, you get what you pay for. The Volt is priced just over $40,000, so even after the government gives you some of my money to buy one, you’re going to pay about $35,000. That’s a fairly hefty price for a car in that class, and you can buy a lot of gasoline to feed a similar conventional car with the money you save by not buying a Volt. If you take a hard look at the Chevrolet Volt and decide to buy it because it’s a quality car that’s very economical and, oh by the way, helps the environment, good for you. I just wish you weren’t doing it partly with my money. That’s the problem with subsidies of any kind. They distort the market and create cottage industries who hire lobbyists to keep the river of green flowing. The more it flows, the more people get employed in those businesses to the point that eliminating those subsidies would end innumerable jobs. Subsidies are the antithesis of free markets because that money was coerced from taxpayers to pay for things that they would freely choose to pay for. I know nothing about cars, but I love the title of the post. As for governmental handouts to buy a specific sort of car (which I would never apply for myself), I wonder if that money wouldn’t be put to a much better use if it were invested into public transportation systems in area where such transportation options do not exist. In my area, public transportation is very good, so I can do without a car altogether. Other places, however, don’t have anything similar. Whenever I hear that there are governmental subsidies offered for buying a specific product, I always start to question whether there is some dishonesty behind that, whether a governmental official has been bribed or offered some kind of an incentive to promote this specific product. Maybe I’m too suspicious of politicians’ motivations. In the case of tax credits for buying electric cars, I doubt that it has anything to do with corruption. This is just another case of politicians with too little knowledge and too much power thinking they can manipulate and fine-tune economic activity. If you add up all the money thrown away like this, it would equal a good payment on the national debt.